Private Coaching For All Runners | Run S.M.A.R.T. 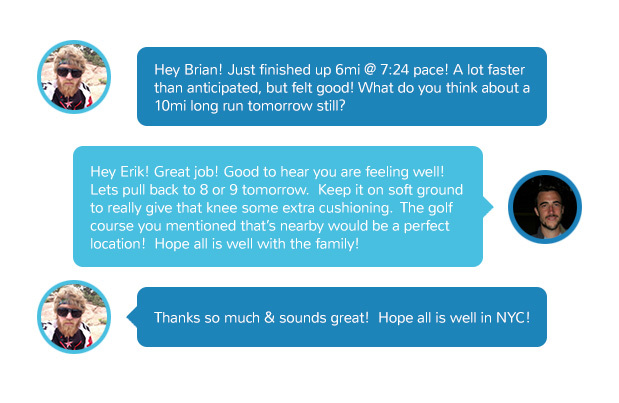 Work one-on-one with a Run SMART coach and receive custom workouts uploaded to your online training calendar. All workouts are customized based on your training history and current fitness. Once you’ve setup your calendar you will always have access to your workouts and can update paces in the future. The app records and organizing your PRs, recent and future race results. I started working with Heidi after bombing out in my first marathon attempt last year in Napa, where I ran 3:30. My next attempt (working with Heidi) got me to 3:19. It’s super gratifying to have a BQ and new PR at 3:12:28. I definitely would not have gotten there without you guys, so I’m really appreciative! I just wanted to let everyone know how grateful I am to be working with Alvina. I’ve been training for the Philly Marathon in November and never really tackled running in quite this way before. She’s a great coach and because of her I’ve seen my abilities skyrocket. The thing that I like the most about working with her is that Alicia absolutely loves, loves, loves running and is willing to do things that most athletes (even professional runners) won’t take the time to do. She is definitely one dedicated chica!